We often take advantage of the electricity that powers our home. Electricity provides power to the lights to our homes and powers every appliance and piece of technology. We don’t realize how much we rely on electricity until a major storm comes through and results in a power outage. That’s why having a generator in your home is a good idea because a generator will power your house until the electricity comes back. Having a generator in your home can help keep your family safe during storms that may cause a power outage. A generator can supply electrical power and assist you to still use the essentials in your home such as lighting, running your refrigerator, and powering your gas furnace. Not only will a generator help you to stand a storm during a power outage, but a generator will also work to protect household appliances from an electrical outage. The protection from a generator will prevent you from having to make costly repairs for your appliances. Before investing in a new generator, there are some factors to keep me in mind. 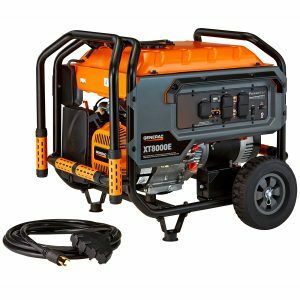 If you live in an area where power outages do occur on a rare occasion, a portable generator may be all you need. A portable generator will be able to run your refrigerator, turn some lights on, and run your computer. With a portable generator, you will be able to last a couple of days if that’s how long you are without full power. When considering generators, you should take in consideration how much power you will need a generator to deliver. A small generator provides about 3,000 to 4,000 watts, and that is enough to run a refrigerator, a few appliances, television, and some lights. In addition to what a small generator can run, a generator that can deliver 5,000 to 6,000 watts will be able to run a window air conditioner, a freezer, and a couple more appliances. If you want your generator to power just about everything in your household, you will need to invest in a large generator that can deliver about 7,000 to 10,000 watts. Investing in a generator protects your family and your household more than you realize. It will protect your appliances from having to use more energy to boot back up after a power outage than they need to. If a power outage lasts for a couple of days, your family will be able to stay warm during the outage and still use your necessary appliances.